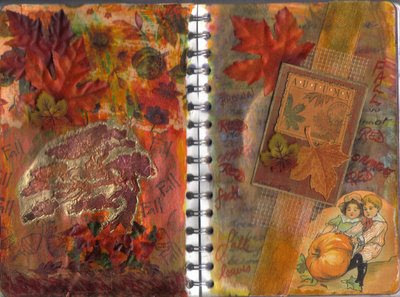 This is a FALL spread I am doing with the ABCanada Yahoo Group I belong to. We each make an ATC pertaining to Fall, and send it out in the mail. That recipient has to make a spread with the ATC as the central focus. Love what you did with my ATC Daphne!!! Great page!